What a caring gift to get 'yourself'! I do get myself an occasional Christmas gift; the last one was a new set of dishes for us, lol. I forgot to get myself anything. I used the Good Samaritan button at Walmart twice for people that had toys on layaway. Well, I'd say you've treated the kittens to a lovely gift: A nice safe place and hope for their future! Bravo to you Lisa....you are awesome. Enjoy, it's going to be a wonderful time to experience! A gift to myself is usually a book. Aww, you are so sweet and unselfless. This is a great cage. And also toys, the kittens will be so happy. I'm thinking it must be better than the cramped quarters of The Shelter. Maybe you will show us your next letter of kittens!? this is so great! such wonderful experience for your boys. Target does have some great clearance deals! Prachtig om zo open te staan voor deze probleengevallen. I think the kitties will never want to leave -sounds like you will give them such a good life as they grow strong and healthy. Will look forward to seeing all the little cuties rescued and being loved - you are very caring to do this Lisa. I admire anyone who saves/cares for animals whether they are wild or domestic. I bet the kitties are going to love it! 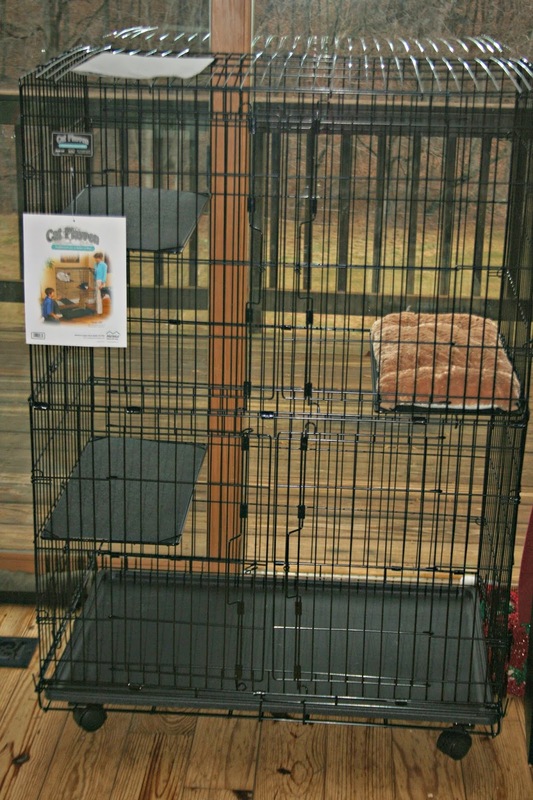 That looks like the perfect cage for kittens. I've never fostered any pets. I do usually have a list of gifts I would like to have. Years ago when I shopped for Christmas presents and I found something really nice I would sometimes buy one for me too. I don't do that anymore, I have too much already and need to downsize. You and my daughter must be related at some level in the distant past. You are the only people I know who rescue animals from horse size to kittens. I tend to specialize in ferret rescues but any dog or cat who can find our dwelling out in the woods is welcome to join us. We cannot wait to hear more. What a GREAT thing to get! I hope to foster kitties some day too. Our plan is to foster instead of having kitties of our own, so we can travel and do stuff without having to worry about pets at home. But I can't bear not to have a kitty here, so fostering would be a great option. Can't wait to see the first inhabitants! That is purrfect! And that gift will keep on giving! You have a very big heart, and I admire you for it. Oh, that is so sweet! I'm glad you are doing this. You put me to shame. I haven't ever fostered any animals. Oh! I did not know that you fostered kittens before. That is lovely! I LOVE YOUR CAT CAGE! Maybe, I'll buy something like that. It's really great to know you are a kitten's mom, since I personally fostered many kittens too, puppies, and other animals in my lifetime. Last time, I fostered 5 kittens. I gave them names too, and kept them for their entire lives. Now, I've got only 3, Sonya, Little Bear & Baylee. But, from the old bunch of kittens, I still have 2. At this point, they are 13 year-old siblings. I have them since they were 15 days old. I bottled fed and cared for them at that time, until they were ready to eat by themselves. Well, Lisa, I've stopped by to say hi. Have a blessed time with loved ones! Well, there are dog people, and there are cat people, and I'm a dog person. So is my wife, but she is allergic to cats. Buy my own Christmas present? Yes, if there is something I really want. Just out of hibernation briefly. Hope your "cat house" is thrilling in the spring. Blessings and Bear hugs, Lisa! I bought some clothes. They were a great deal. I haven't gotten the package yet. Hummm...I wonder where it's at? I almost forgot about it. What a good person you are! We took in a cat found in a barn and now have 5 cats. My pressie was a Trailcam!